Web-Apps are the future. Running in browsers on all end devices, they reduce the development effort and save costs. In contrast to established App Stores, current technical conditions are lacking ways to ensure conditional access. Fraunhofer FOKUS is working on such an App DRM system that makes it possible to enable different usage models and their secure access control for Web Apps. Thus, they are accountable and enable new revenue models for App developers and App providers. Be able to configure the own dream car in parallel to the running advertisement spot is not a vision of the future any more – even direct via remote control on TV. Together with leading partners of the German automotive and broadcasting industry, Fraunhofer FOKUS presents an interactive car configurator for Smart TVs. Based on the new hybrid TV standard HbbTV a click on the Red Button on the remote control is sufficient to invoke the interactive application, which runs in parallel to the TV content. Whether it’s the color, the engine or a 3D model, the viewer can assemble his car of choice and book a test drive instantly – everything in amazing HD quality and convenient on the TV set. Internet-enabled TV sets and set-top-boxes take the CE market by assault. Today almost any device is shipped with internet capabilities. Simultaneously, the number of devices and different versions of hard- and software is growing rapidly. This fosters the demand for interoperability, standard compliance and builds the basis to display and execute TV applications correctly. Fraunhofer FOKUS addresses this demand by providing the FOKUS HbbTV and OIPF Testing Suite. The solution offers a comprehensive tool that supports both, the product development process for manufacturers of new hybrid TV sets and set-top-boxes, as well as providers of CE-HTML and HbbTV applications in the application and portal development. In addition to standard conformance testing on HbbTV and Open IPTV Forum (OIPF), the system allows the testing of features such as visualization, navigation, rendering and graphics, as well as the support for audio and video content of CE-HTML and HbbTV applications. Non-linear video is a technology developed by the Fraunhofer Institute FOKUS which makes video content an interactive experience. Non-linear video gives the viewer the opportunity to interact with objects that are part of the video and access supplemental information. On demand, multimedia content is linked with related information. Interactive, time independent navigation opens a new ways to experience video content. 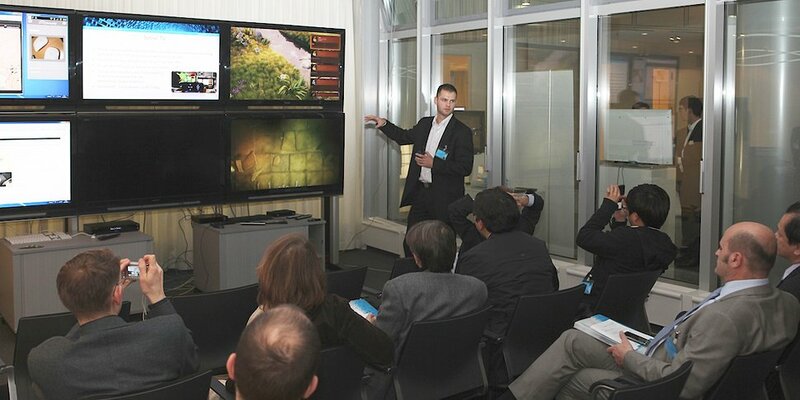 The new and interactive formats are available through various end devices as smartphones, TV sets, PC or tablets. HTML5 Web Apps are supported as well.